Subscribe to get exclusive interviews with CMOs and stay up to date with the latest developments in marketing. We interview innovators and leaders in marketing to deliver you the latest trends and strategies you need to stay ahead. Jennifer Johnson, CMO of Tenable and startup advisor at Play Bigger, discusses all things category design, including best practices, case studies, and more. Shannon Pruitt joined Marketing Trends to explain how she helped forge great branded content on original media properties like American Idol. Benton Crane, CEO of Harmon Brothers, joins Marketing Trends to discuss how his company has created viral videos that have generated over a billion views. Josh Golden, President and Publisher of Ad Age, joins to discuss disruption, why marketing is getting more difficult, and his work on the OJ Simpson trial. Storytelling is a key component of marketing. Yet few marketers seriously study the art and science of constructing stories. On this episode, we talk to someone who has: Clay Hausmann. Clay uses storytelling techniques learned from a stint in scriptwriting to shape his marketing. Many marketers aspire to turn their customers into a tribe. They dream of their customers transforming from casual users to passionate advocates. But how do they do actually do it? To find out, we talked to Coupa CMO Chandar Pattabhiram. He also talked about the two types of "AI" for marketers and the "Stairway to Heaven" playbook for revenue marketing. We sat down with Thomas Butta, CMO of SIgnalFX, to talk about how to make your marketing cut through the noise of the modern digital world. On this episode, Tom also discusses challenger brands and how to make your brand an industry thought leader. This episode of Marketing Trends was conducted live at the Salesforce World Tour in Chicago. It features an interview with Tracy Eiler, CMO of InsideView and co-author of Aligned to Achieve: How to United Your Sales and Marketing Teams into a Single Force for Growth. What can a new CMO do in the first 90 days to make sure they have success with their new organization? How can they make sure they are on the same page as the sales team from the get-go? To answer questions like these, we talked to Ed McDonnell. What separates a failed content marketing strategy from an effective one? To help us find out, we brought in Joe Pulizzi. Phil Raub, founder and president of b8ta, is helping to define the future of retail. He joined Marketing Trends to discuss what is next for the retail industry as well as share stories from his time with Nest, Nintendo, and Gap. This episode features an interview with Matt C’de Baca. Matt has more than 15 years of experience in talent acquisition and executive recruiting. On this episode, he talks about how to succeed as a marketing executive, the most in-demand talents and abilities, and how to find purpose in your work. John Gargiulo, Global Product Marketing Lead at Airbnb, joined Marketing Trends to discuss the gap between product marketing and brand marketing. Vanessa Hope Schneider, Head of Marketing at Clara Labs, joins to discuss how to understand your customers, and how to make sure they understand you. Paul Ghio, VP of Product at Creative Market, discusses how to market a marketplace, design, analytics, and how he went from marketing to product management. Justin Shriber, VP of Marketing for LinkedIn Sales and Marketing Solutions, joins Marketing Trends to discuss how sales and marketing are converging, and how marketers need to adapt. 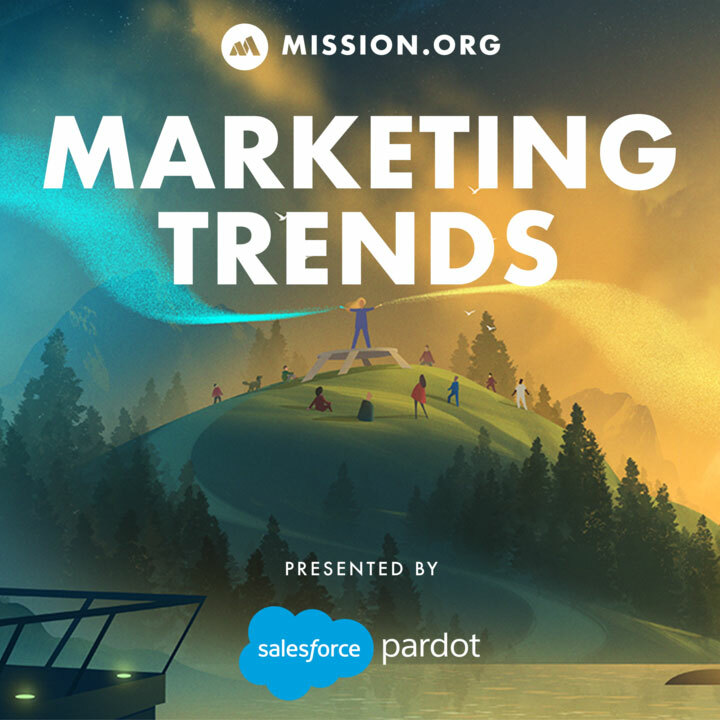 Futurist Peter Schwartz, SVP of Planning at Salesforce, joins Marketing Trends to discuss how to predict the future, and how marketers can help create it. How can ABM be used most effectively? And how will ABM technology change in the near future? We brought in Peter Isaacson, the CMO of Demandbase, to help us find out. Nicole Kingsley Brunner, CMO of Manning & Napier, explains how she turned her organization's marketing department from a cost center to a revenue generator. Corinne Sklar, CMO of Bluewolf, joins Marketing Trends to discuss strategies for CMOs, women in tech, and why "if you build it they will come" is wrong. Corinne Sklar, CMO of Bluewolf, joins Marketing Trends to discuss the strategies that helped her grow Bluewolf's revenue from 3 million to over a billion. In part 2 of our interview with Rob Norman, he talks about how to generate demand, measure pipeline, attribute credit, and more. Rob Norman, Director of US Field Marketing at Box, joins to discuss the lessons he has learned from marketing in France, the UK, and Silicon Valley. How do marketers get sales organizations to buy in and support their efforts? TJ sat down with Ian and Lauren, to discuss this as well as how to approach attribution, and what he wish he had known about marketing earlier in his career. Nate Skinner joins Ian and Lauren to discuss how to use technologies like artificial intelligence and augmented reality to create memorable marketing experiences. Ron joins Ian and Lauren to discuss why he likes the role of CMO/COO, and what it was like to raise money from one of the Shark Tank sharks in the middle of a recession. Ada Chen Rekhi joins us to discuss her background as a marketers and founder, the anatomy of a marketing organization, and how she hires great marketers. In part 2 of our interview with Norton Lifelock Global CMO Ty Shay, he shares his original theory of performance storytelling, and shares his best lessons and tips for managing a marketing career. Norton Lifelock Global CMO Ty Shay discusses how to create a campaign that will stick in people's minds, how marketers misunderstand their basic function, and why Ty thinks you should turn off your marketing. Zendesk CMO Jeff Titterton joins Ian to discuss his background, the future of AI in marketing, and how product launches are frequently mismanaged. Beth Comstock and Mission CEO Chad Grills discuss how to stop tribalism in your business, developing better frameworks for creativity, and the writing process behind Beth’s new book, Imagine It Forward. In the second of two parts, Brian again joins Ian and Lauren to discuss what the most important trends in 2019 will be, and how marketers can take advantage of them. Brian joins Ian and Lauren to discuss what the most important trends in 2019 will be, and how marketers can take advantage of them. How can marketers use engaging storytelling to hook their audience? Mission CEO Chad Grills sat down with Meredith Ayan, Executive Director of SPCA International, to answer exactly that. Joely Urton is Vice President of Analyst Relations at Box. On this episode, she discusses all things analyst relations, including how to manage an effective AR program, how to measure its success, and when a company should begin an AR program. Jaleh discusses what she learned working with Jeff Bezos, how to be customer-obsessed, and best practices for conducting effective market research. Matt discusses the "dirty secret" of launch products, the best advice for a new CMO, and why he thinks press releases are useless. Christopher and Ian discuss why category design is the most important skill set for a CMO, why competing is bad, and how to get creatives to do legendary work. Lauren and Ian finish their discussion of the 40 most impactful Apple ads of all time. Lauren and Ian start their breakdown of 40 of the most memorable and impactful Apple ads and discuss what marketers can learn from them. Sean Sheppard, founder of GrowthX and GrowthX Academy, joins Lauren and Ian to break down the x's and o's of how to get sales and marketing into alignment. Lauren and Ian explore why CMOs have the shortest average tenure in the C-suite, and how to combat this trend. Shannon Duffy tells us how she thinks about building a marketing team from the ground up, and how "Melrose Place" inspired her to get into marketing. Menaka Shroff discusses how she manages to find great companies to work for right before they take off and how to better align sales and marketing. Ian and Chad talk with Mark Viden shares the early impact of reading David Ogilvy, how he deals with rejection, and sheds light on his 17-year career at Dignity Health. What is Marketing Trends and how did it come to be? These are the questions Chad and Ian answer on Episode 1 of Marketing Trends. Our weekly newsletter will keep you up to date with news, trends, and analysis for marketing executives.